Fashion is typically the realm of elites and urbanites, but a new project in the UO's Department of Product Design will bring fashion and design to an unusual place: prison. The “Community Clothing Project” will expose fashion design to broader audiences by bringing design students together with prison inmates to produce a clothing line. 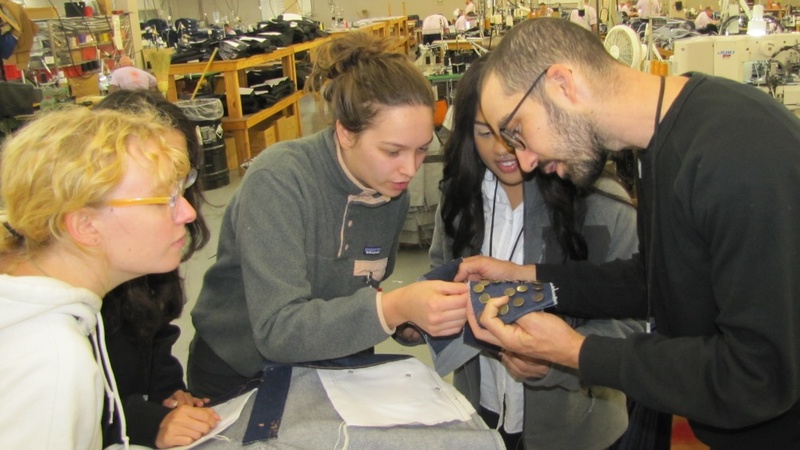 The partnership involves the production of a new fashion line for Prison Blues, a clothing line produced through the work opportunity program at Oregon Corrections Enterprises. Funded in part by a $36,000 grant from the National Endowment for the Arts, the project will investigate how design can engage differently with society and industry, and how it can contribute to innovation and economic development. Prison Blues is a clothing production company employing inmates through Oregon Corrections Enterprises. UO design students will work directly with the company and incarcerated adult employees to produce the line. The design collaboration offers contemporary design sensibilities for the goods being produced, while providing manufacturing knowledge and workplace training for students and incarcerated persons, Muenchinger said. The collaboration marks the second partnership between Oregon Corrections Enterprises and the UO Department of Product Design, which is part of the School of Art + Design in the College of Design. UO students also produced a line of furniture in collaboration with the group in 2017. “We enjoyed working with them so much, and there is a lot of value in the partnership and with working with workforces and prisons,” Muenchinger said. The collaboration, she said, will show how designers and artists can work with the prison workforce system and engage a community discussion around prison workforce training, production and compensation. In fall 2018, the design students made a trip to the production facility in Pendleton to meet the employees and learn about the production process. Tom Bonamici, a pro tem instructor in the Department of Product Design who teaches the course, said the experience was enlightening for students. For incarcerated adults, Muenchinger said, the partnership offers the opportunity to gain experience moving through a hiring process and working collaboratively on production. Positions in the Prison Blues manufacturing line are highly coveted, and employees gain a variety of production and manufacturing skills that can translate to future employment outside of prison. Muenchinger hopes that the collaboration will add variety to the skills Oregon Corrections Enterprises employees learn on the job. The collaboration also provides a valuable opportunity for students to gain design and manufacturing experience, Bonamici said. Instructors say integrating input from employees is a valuable component to the design process that will inform what students design, helping designers understand what problems and challenges to be aware of in the production process so they don’t produce designs that are impossible to manufacture. Sixteen students will each produce at least one article of clothing and have the potential to produce more. The Prison Blues apparel line is typically produced and marketed to a niche market — loggers, farmers and workers — but students also will have an opportunity to seize on current trends and get creative with the direction their designs go and see how they align with current markets. The Prison Blues line is expected to exhibit in Wanted Design, a design-focused trade show hosted in Brooklyn, in 2019.